In 1 hour(approx) Phillips Zoom WhiteSpeed is clinically proven to whiten your teeth upto eight shades. 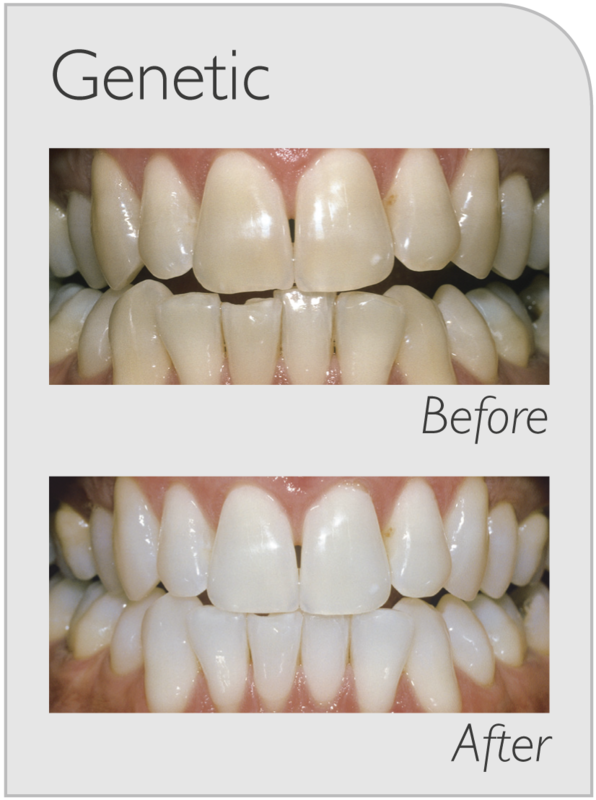 This is quite simply the fastest, easiest and most effective whitening solution offered by zoom. If you want instant gratification this is your best choice. You just lean back and relax while we complete the entire procedure. Go ahead and listen to music or even take a nap. 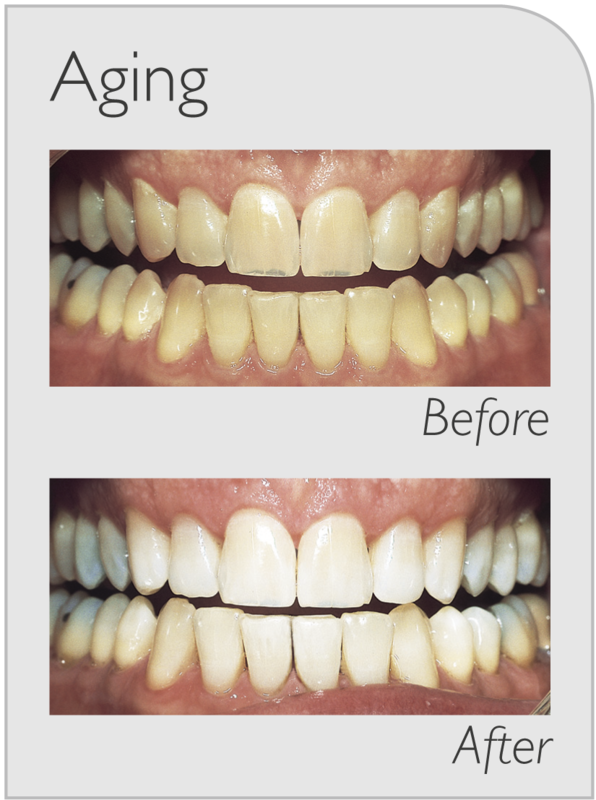 For information on our latest promotions on Teeth Whitening please contact us. For those who want results now, a Philips Zoom WhiteSpeed in-office treatment offers a smile up to eight shades whiter with a 45-minute* application by your dental professional. Philips Zoom WhiteSpeed uses a proprietary LED light to accelerate the whitening gel chemical reaction. It is a fast and safe procedure powered by innovative technology. After an initial oral exam, the complete treatment takes one office visit. The procedure begins with a short preparation period followed by three 15-minute bleaching sessions, with an optional fourth 15-minute session administered at the discretion of your dental professional. Your dental professional will perform an examination to verify you’re an ideal candidate for whitening. After a shade assessment, your dental professional will discuss available whitening options and how to prevent sensitivity. Temporary tooth sensitivity, especially to cold, may occur during or after the whitening procedure. Your dental professional will recommend using toothpaste for sensitive teeth for two weeks before the procedure. If you are a good candidate for whitening, your dental professional will take impressions for your custom fabricated trays. Make an appointment to see us now! Your dental professional will instruct you to take one ibuprofen an hour before procedure. Your procedure starts with an application of vitamin E to your lips. Your gums are covered with a protective barrier and your teeth are coated with Philips Zoom WhiteSpeed in-office whitening gel. The WhiteSpeed lamp will then be positioned near your teeth to accelerate the whitening process. The procedure consists of up to four sessions each lasting 15 minutes. 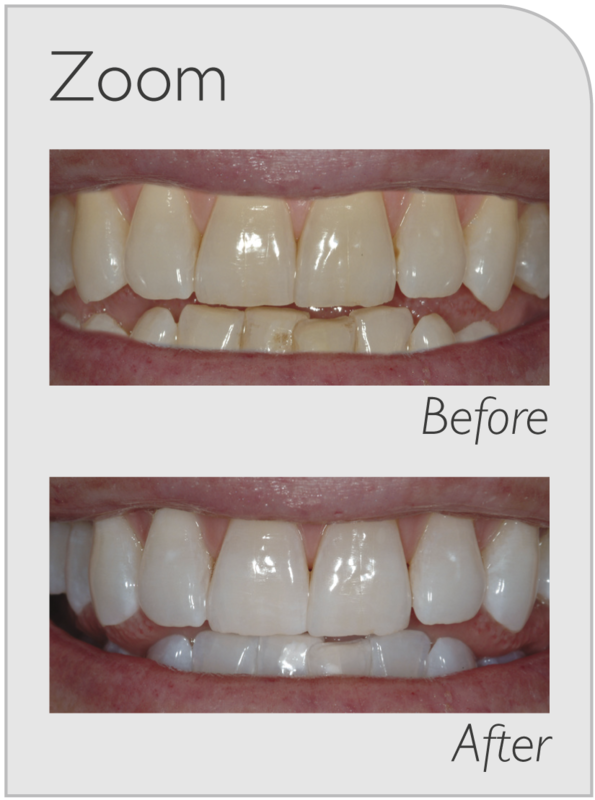 For each session, the whitening gel will be replaced by a new coating. Your dental professional may adjust the lamp should you experience any sensitivity. 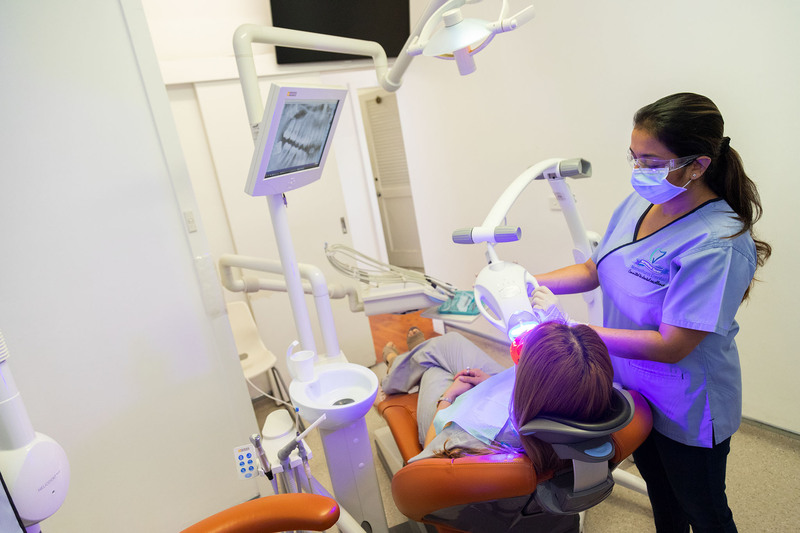 After the last session you will receive your custom fabricated trays, one DayWhite or NiteWhite take-home whitening gel syringe containing three whitening applications, plus a Relief ACP Oral Care gel syringe to relieve any potential tooth sensitivity. If you consume beverages that stain teeth, such as coffee, tea or wine, or if you are a smoker, brushing with a Philips Sonicare DiamondClean power toothbrush will help reduce surface stains. You’ll find information on Teeth Whitening in this article on our blog.